Tom Raworth (1938 – ) is a British poet and visual artist. With around 40 books published, he crystallizes imagery with deft phrasing, delighting the reader and often confounding the critic. “The Moon Upoon the Waters” appears in his Collected Poems (Carcanet, 2003). 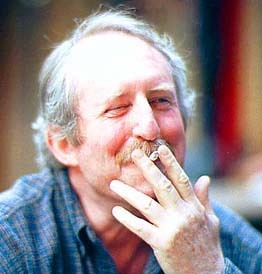 This entry was posted in Tom Raworth and tagged British Poetry, Poetry. Bookmark the permalink. Hmmm… What would this style be considered? It feels highly experimental. There is a strong cyclical element to it, a House That Jack Built going around in circles. The style of this poem does not resonate with me personally in the way that your Friday Poetry Series posts often do, but I do appreciate the experience of being exposed to something different. Sometimes art rubs you the wrong way, is even intended to, and that experience has its own benefits and leaves its own unique mark on you as a reader. Sivan, I think Raworth is influenced by the New York School and is embraced by the Language poets too. He’s generally more warmly received in America than in his own country. If you have time google Raworth and listen to his live reading of this poem on poetryarchive. I love hearing it. WOW! It causes me to think way too much! Totally enjoyed the symbolism. I’m lost for words… so much to think about, swirling & spurting – as it were, not as it ought to be. True, it’s not as easily accessible as some of the poetry I’ve posted, but I’m glad it gave you something to think about – that’s the way it ought to be. There is a lot that came out of the New York School and the Langauge poems that I have never been a fan of. I am not one for John Ashbery. (Pause while every poet I know gasps aloud.) I love, however, Barbara Guest and Bernadette Mayer who both come from one or both of those groups. Perhaps I prefer the way women attack language poetry because they are able to more strongly tie emotion and a sense of story to their work? Or perhaps I am generalizing too much. All in all I think it is important for their to be art that rubs some people the wrong way. All aspects of art should be explored, and that is inevitably going to lead to some people not getting it or disliking it. Art should cause reactions in people, one way or the other. Well, better to be rubbed the wrong way than never to be rubbed at all. I’ve been thinking lately about how much of poetry should be emotion, and how much should be intellect. Maybe it’s unsavory to drift too far to either side. By the way, the response I left above digging into the poem a little wasn’t directed at you so much as at a certain facebook friend who didn’t find meaning in it on first glance. Have faith, the Emperor is wearing new clothes. Interesting. The extra O is probably the full moon inserting itself into the title. Influences are always problematic, and based on what the reader, rather than the writer, has read. This poem is from a book published I think in 1968, long before Language Poetry reared its head.